The first encounter with wine was basically at hospitality school not thinking at that time that one day it would become my profession, hobby and life. After that the maître at my first job was highly enthusiastic about wine and I got the possibility to try a lot. A Sommelier should always be humble, relaxed and have the ability to listen to the guest. He should definitely know how to work and should not have an allergy to bone china. I admire a lot of my colleagues who serve guests at the highest possible standard instead of boasting. A real Sommelier is to be found in the restaurant on the floor, not on a stage or on the internet but, of course, this is as well part of the game. I would start in good – not the best – restaurants with an international wine list and a committed person as a superior. That way you will get the opportunity to serve and actually taste a lot of wines. As a Commis in the best houses you will start with polishing hundreds of glasses a day and getting the bottles ready and normally have a very small chance to serve and taste wines. After two years in this position you should think about going abroad as a Commis. A person starting in the wine trade should be ready to invest a lot of time in learning about theory which is the basis for everything else. First of all, try to find out about the guest’s preferences. Which style does he prefer? Does he have a favourite food-wine pairing? Does he have a predilection for certain countries/grape varieties? What is his budget? Most importantly, listen to the customer and try to serve him wine that fits his preferences instead of trying to sell him the most expensive wine or to convince him of your personal taste. Maybe, the customer is happy with a wine the Sommelier personally does not like at all. Nevertheless, the goal is to make the guest happy and turn him into a regular customer. I personally think that one should not have too many different glasses to choose from. You can easily get lost choosing from a selection of 10 different wine glasses for particular wine styles. Instead, your focus should rather be on the temperature of the wines when serving them. Unfortunately, the perfect temperature is often a neglected aspect of serving wine. However, there is a huge difference whether you serve a wine in January at minus 15 degrees or in August with 30 degrees. The glass used should be very delicate and thin, but still easy to handle and machine-washable. The times of polishing glasses till 4 am should be gone by now. Know your food and know your wines. This is definitely the most difficult part of our job. Always try to focus on the most intensive part of the dish and not “only” the meat. The taste can come from the sauce and/or side dishes. Be very careful about this aspect. As for the wine, it is not only about choosing the right bottle, it is also important to serve it at the right temperature and select the right glasses. Wine and food pairing is the Sommelier’s personal Champions League. Yes, because I think that I can handle awkward bottles, faults and so on. These wines should never get to the table and instead I can tell the customer that I changed the bottle into one without any faults. Also, to check the temperature of it. Does it need to get aired or decanted and then I can make some suggestions to the customer. Never go ahead and serve, for example, a white wine with 15 degrees and aired without checking with the guest, even if this is a 100% correct. Always advise the customer first that it would be better this way. If he still wants it at four degrees: okay, it is his wine. Forget the internet, go out there and speak with the right people and show your enthusiasm. The wine list should always match the style of the house you are working in. In a fish restaurant, it is not really necessary to have 80 % red wines on your list. After that comes the selection to match the food, then the guests’ taste, and finally your own taste. The longer you stay in a restaurant and the better you know your clients, the more extraordinary things can be introduced. Always think that when your clients are happy, the boss will be happy and if the boss is happy it will definitely reflect on you and you will be happy too. Markups are an in-house policy, some of them are ridiculous. You can always try to introduce a new one but as long as you don’t have your own business it is hard to change this one by yourself. Studying, reading, travelling, internet, Facebook, Instagram, Twitter… Get out there and talk with the winemakers, colleagues … Never stop learning and don’t become big headed or a wine snob, nobody knows everything! To come with the wine, tell me about it and let me taste it. Every wine gets the same respect in the beginning. I do not care about names, points, medals and so on, I try to rely on myself and not to copy anybody. A field plant, it combines the best attributes of different grapes and styles. I always have a bottle of Grüner Veltliner and Champagne chilled. And a bottle of red Burgundy is as well always “ready” to go. Deserted-island-wine, at the moment, would be a Magnum Le Mesnil 1987 from Bruno Paillard. 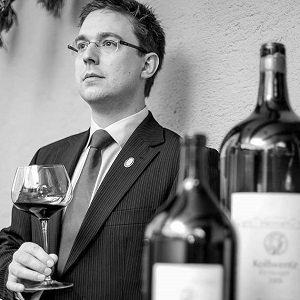 Decanter, Falstaff, Wine Spectator, Blogs, Feinschmecker, Der Sommelier… to name just a few.